I love it when Globe columnists argue with each other in print, especially when one of those columnists is the writer we all love to hate (because she makes herself disagreeable intentionally to sell papers), Margaret Wente. The other is Adam Radwanski, and over the past few days both have weighed in on taking stock of the Green Party of Canada after a 2011 campaign that is hard to classify, as the party reached new heights, and fell back to old lows. Wente wrote yesterday in ‘Hard questions for Elizabeth May’ that the Green Party was the the real loser in the 2011 election for having lost almost 50% of its voter share while dropping to an 11-year low. In classic Wente fashion, she can’t write sympathetically about someone or something without twisting the knife a little, which she does here in claiming that the media gave May a “hugely sympathetic” free pass that neither she nor her party deserves. God, I’d hate to see Wente when she’s against you if her kindness and sympathy is this transparent. Ms. May is a romantic green, masquerading as a rationalist. Her chirpy optimism reassures us that we can have it all. Well, we can’t. Greens love China, because it leads the world in green technology. But greens neglect to mention that hundreds of millions of Chinese people have begun consuming stupendous quantities of brick, copper and manufactured goods in their rise from poverty – nearly all of it produced with fossil fuels. And while I agree with Monbiot that there are fundamental questions facing not just the small Green Party of Canada but the global environmental movement, Wente’s use of Monbiot is comparing apples and oranges. What Monbiot writes about at the global level can only be applied to any micro level with caution, of which Wente exercises none, as per usual. It cannot be held against the GPC for supporting green technology investment in China often means a causal support for fossil fuels, though Wente would have you think it does. In China, as in Canada, the GPC pushes for a realistic compromise between the needs of citizens, and the need to move away from dependence on fuel systems that are destroying the planet. Hence, the push for green infrastructure, as opposed to cabins in the woods heated by peat and wood. They are not Luddites, Ms. Wente, and you cannot have it both ways. And I, for one, have never heard May reassure us that we can have it all – only that the way forward is murky, and best navigated with as much respect for the environment as we can possibly muster. Heaven forbid. 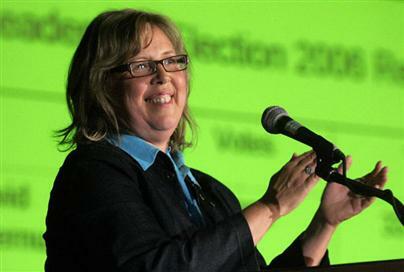 Thankfully, Adam Radwanski – the more intelligent and tempered of the two writers – acknowledges in ‘Elizabeth May’s win, the Green collapse and our broken electoral system’ that May’s win, and the poor showing of the GPC, says as much about the poor state of our electoral system as it does about the fortunes of the Greens. After losing two elections, one in which the percentage of voter share was 2/3’s of the Bloc’s voter share but the Green’s received no seats and the Bloc 49, May made the reasonable decision to concentrate her support and run what was, in essence, a local campaign with national inklings. So don’t hate the player, media – hate the game. And Radwanksi understands this. “But just as it was beside the point to complain about Ms. May’s exclusion from this year’s debates, which was really just a reflection of her relevance within the current system,” he writes, “it’s equally beside the point to criticize her for making the best of what that system dealt her.” May is simply playing in a broken system the best way she can – the only way she can, in fact, as chirping from the sidelines is never as influential as having your voice heard from within the halls of power. And if we don’t like the system, or find it distasteful that May and other would-be politicians in smaller parties must sacrifice their national vision for the sake of winning a seat, if we think this Faustian bargain has no place in modern Canadian politics, we have only ourselves to blame for not insisting this broken system be replaced. Thanks so much for sending this along.